The Grants to States Program is the largest grant program run by IMLS; it provides funds to State Library Administrative Agencies (SLAAs) using a population-based formula set by the law. SLAAs determine goals and objectives for the funds in their statutorily required five-year plan. For more information, see the Grants to States program overview. Prince George’s County Memorial Library System launched a statewide data analytics project that included licensed software and training for Maryland’s library systems. The project created customized reports for areas such as call number circulation statistics, library-branch service area mapping, and fiscal year transactions. By tracking various data elements through time, participating libraries were able to pinpoint local and regional trends that could help them make staffing, building, purchasing, and other major decisions. Related projects included liaison support from the state library, the formation of a statewide statistics working group, refinement of the Maryland Annual Public Library Survey, and support for the data analytics software. To support this work, Maryland’s Statistics and Data Coordinator served as the data liaison for the state’s public libraries, answered questions about library data and statistics, and organized several training opportunities. Maryland AskUsNow! is a 24/7 statewide interactive information service that uses the expertise of librarians to provide Maryland residents and students with answers to questions, research guidance, and help navigating the Internet. 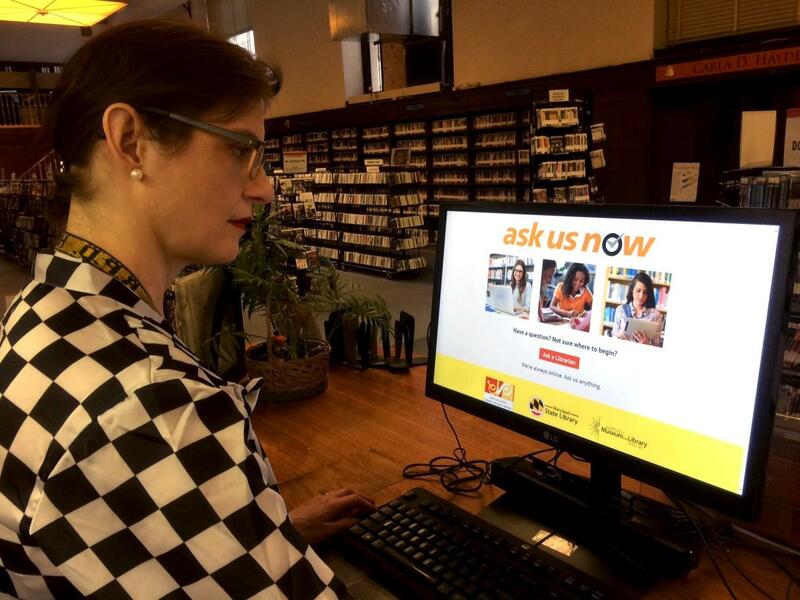 Administered by Enoch Pratt Free Library in Baltimore, the service exceeded its annual target by answering more than 41,000 questions. During the grant period, the library partners engaged with schools and institutions to collect and report data under a statistical sampling model. This model categorized the different types of chat questions by the level of difficulty. Levels 1 and 2 were directional/circulation and policy questions, while Levels 3 and 4 were student assignment/research questions. The grant period totals indicated that AskUsNow! chat librarians answered Level 3 and 4 research questions 60 percent of the time. When surveyed, 96 percent of customers were “very likely” or “may” use the service again. Grant funds helped provide assistive technology to Maryland residents and expand virtual reality programs for users of all ages. Led by Maryland's Library for the Blind and Physically Handicapped, more than 100 public library branches across the state received assistive technology workstations for residents protected by the American Disabilities Act (ADA). The workstations featured electric height-adjustable tables with computers, 27-inch monitors, special keyboards, and software for screen reading, screen enlarging, and capabilities to read aloud any print text. The Virtual Reality (VR) Roadshow was launched to provide training to library staff about setting it up VR equipment and guiding the public through various user experiences. View the IMLS funding by state report - Maryland (PDF) with additional information about all IMLS funding for this state (FY 2018 – FY 2022). Goal 1: The Maryland State Library will strengthen libraries’ institutional capacity through collaborative continuing education and staff development opportunities that will create a strong and innovative library workforce. Goal 2: The Maryland State Library will help libraries improve access to information for their users. Goal 3: The Maryland State Library will help libraries develop lifelong learning opportunities in order to improve users’ formal education and general knowledge and skills. Goal 4: The Maryland State Library will help libraries foster economic and employment development opportunities in order to facilitate job growth in Maryland.